I will move swiftly passed the spare room. Yes.. it has been decorated to a point & I am currently reconditioning the window. However the most progress has been made downstairs. Walls have been filled & sanded & the majority has been decorated at least in Dulux trade white. 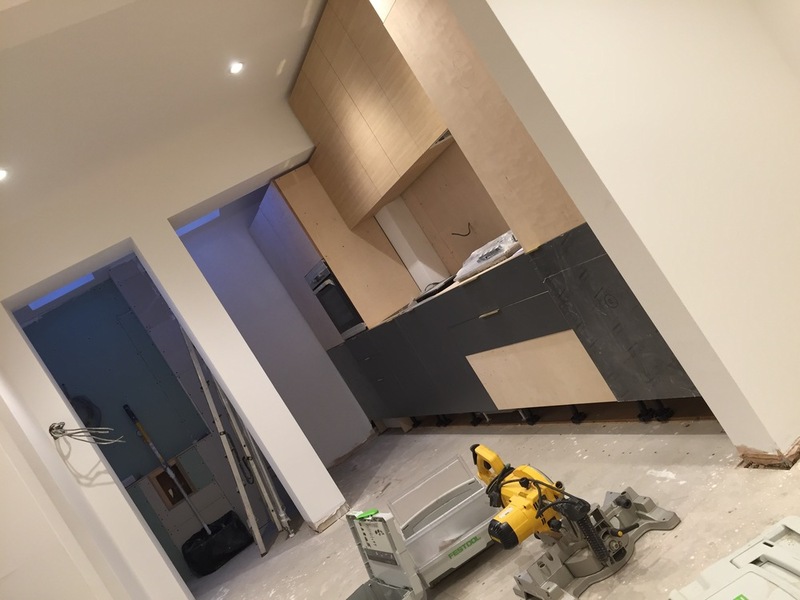 All radiators have been installed & ceiling downlight are in & working. So...I am making progress, tortoise style progress. She was cool about it though. It has been a question of time & money. Or more accurately time or money, both mutually exclusive, both in short supply. However this has led me to take a more philosophical approach to the completion of Frederick Place. Rome was not built in a day. No, no, no...It took time ladies & gentlemen. I decided to insulate the exposed gable end wall. It was difficult to decorate & was always going to be cold, so I framed & lined the wall with 50mm Celotex. 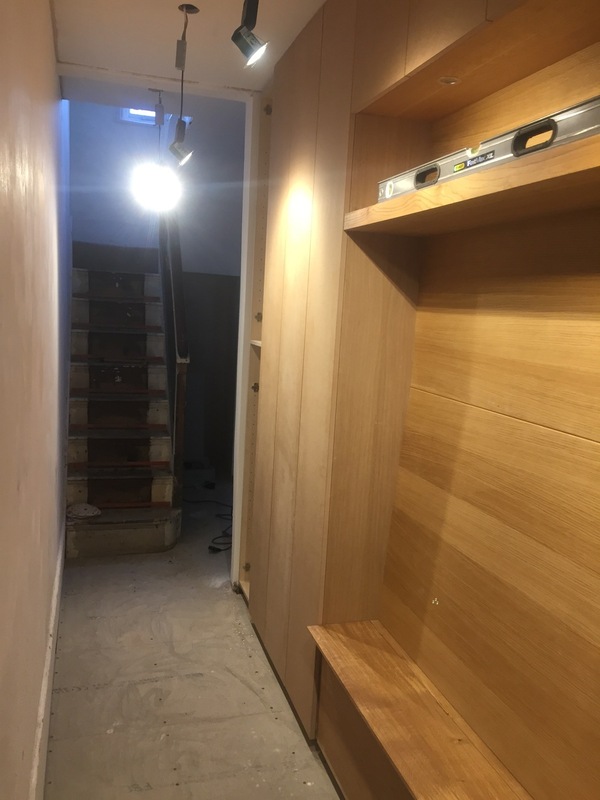 Then clad the wall in 12mm pre veneered oak board & just to be difficult cut everything at random intervals on a 15 degree angle. I hoped the vertical lines would help level a very skewed room (Old Brighton House) & the angles distract the eye from other out of level oddities. I worked & scribed a 2 mm shadow gap at the sides & ceiling & then lavished a coat of danish oil over it. You will also note that I have reconditioned the existing sash window which was painted shut. Replaced the cords, calibrated the lead weights, replaced all the architrave & made a solid oak sill/ledge & replaced most of the hardware for new shiny brass. I have also redecorated the room in a Dulux trade brilliant white, replaced some of the skirting & decorated the wood work in Farrow & Ball Ammonite eggshell. This also includes the door with sparkly new brass hinges. Still lots to do but...its getting there. Bathroom tiling, plumbing, corian, 2nd fix plumbing, Glass shower surround. Floor. 1st Floor painting & decorating. However I have managed a few things plus the remains of the building work. Plus I have installed a rather lovely storage wall as you enter the house. Hooray!!! The end is in sight I think...lots of digging, lots of excavating, but there are signs of the overall design coming together. The doorway for the new bathroom has been created and is ready to receive a new steel from pier to pier. The chimney has almost been all removed providing a clean run for the new kitchen. Dismantling old houses is always going to be problematic. Mildly if you are lucky. In our case at Frederick Place we have uncovered a few little treasures including a well....under the bath. We have had to excavate atleast half a metre below ground level to check the footings on all exterior and party walls. In doing so, in the existing bathroom we uncovered a little hole, which turned out to be a big hole. So, with advice taken from the structural engineer we back filled and cemented, problem solved. 250 bags of rubble have been removed from under the house. Just random rubble, almost touching the underside of the floorboards. You could of built another house with it I would wager...bijou, but definitely a shelter. Why oh why would this be deemed good practise other than saving money. As a result of decades of poor ventilation and damp inducing conditions, the vast majority of the joists will have to be replaced. There is a positive though as we can now continue the raised floor into the also newly excavated exterior. The goal being a lovely, beautifully level & insulated floor that will run through out the ground floor. So it would seem we have a small issue with the gable end elevation... Years of exposed flint & brickwork has made this wall prone to damp. It needs to fixed, treated & rendered by way of some complicated scaffolding. Both Ollie Reed & Keith Moon whilst seemingly unperturbed are in complete agreement & can't wait for it to be resolved. Cheers Fellas! SHOVELS, PNEUMATIC DRILLS, CRACK, BANG & WALLOP!! Bungaroosh is composite building material used almost exclusively in the English seaside resort of Brighton between the mid-18th and mid-19th centuries, when it grew from a fishing village into a large town. It can incorporate any of a wide variety of substances and materials, such as whole or broken bricks, cobblestones, flints(commonly found on the South Downs around Brighton), small pebbles, sand and pieces of wood, into hydraulic lime and shuttering it until it set. 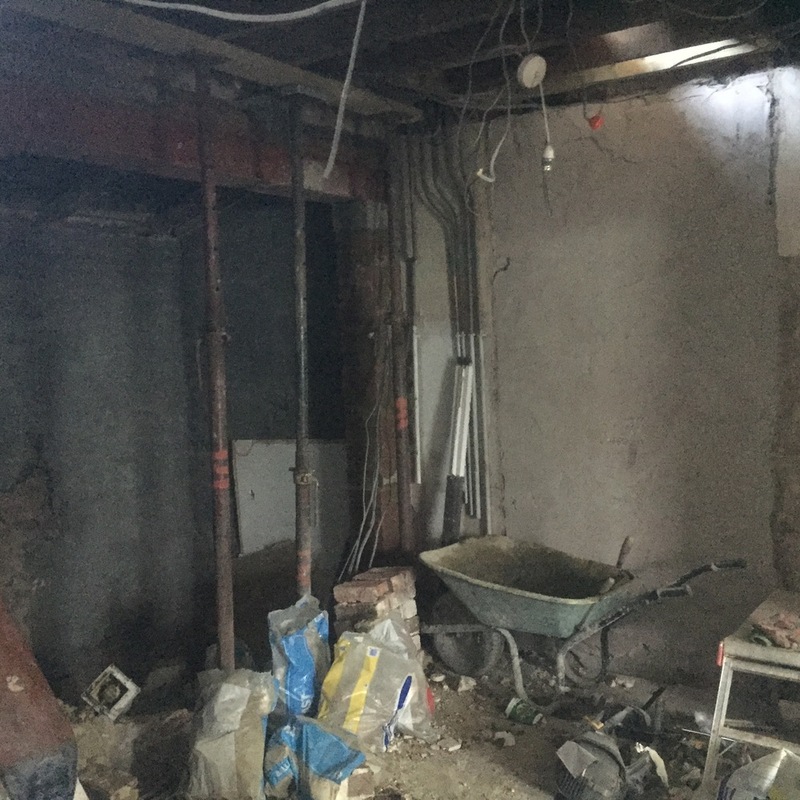 SQ1 STARTS HOUSE RENOVATION IN THE NORTH LAINE BRIGHTON. 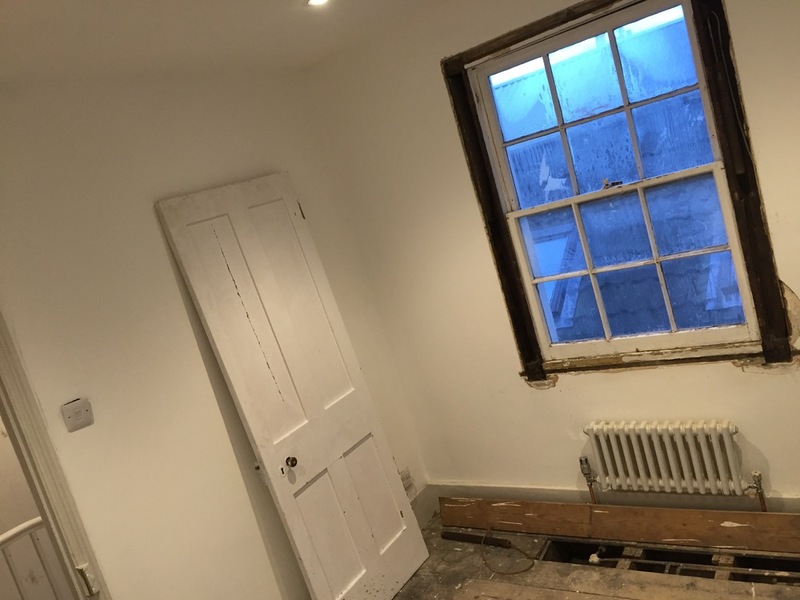 We are just about to start a new renovation to a small terraced property in the North Laine. Planning has been granted to extend the property, remove rear chimney breasts, replace interior plaster and render, new bathroom, electrics & plumbing. 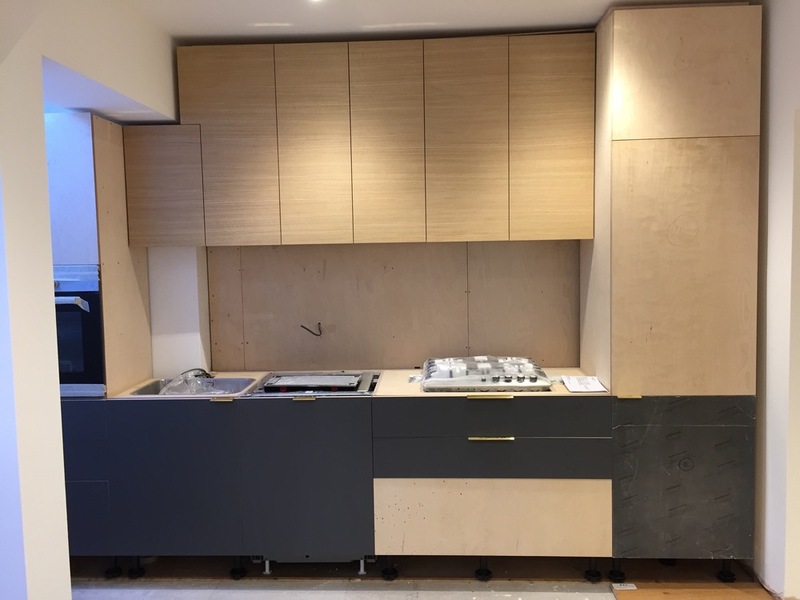 SQ1 will be project managing the build works and providing a new kitchen, shelving and storage in keeping with the overall concept design. 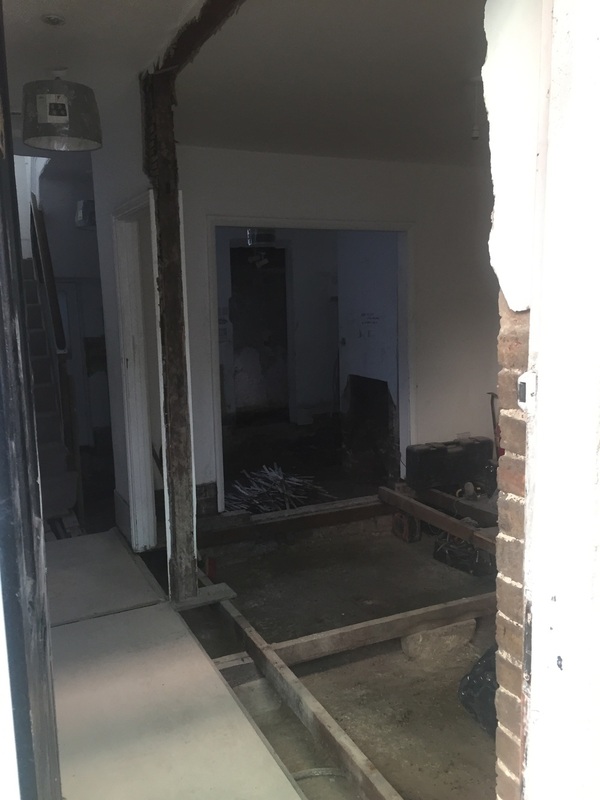 I will be blogging our progress over the next 6-8 weeks, documenting the transformation of this terraced property in need of some TLC in the heart of Brighton.